Most of the mentoring meetings are in the Mitchell Earth Sciences Building on Stanford. campus. The Hartley Conference room is on the first floor, across from the elevator and restrooms. After 4pm all A, C, and visitor parking spots are OK – if the lot is full, there is a parking garage on Morris Way. Take the University Avenue exit and proceed into Stanford University (street turns into Palm Drive). Turn right onto Campus Drive West. Continuing past the medical school, turn left at Santa Theresa St. and park in the area between Morris Way and Lomita Drive. 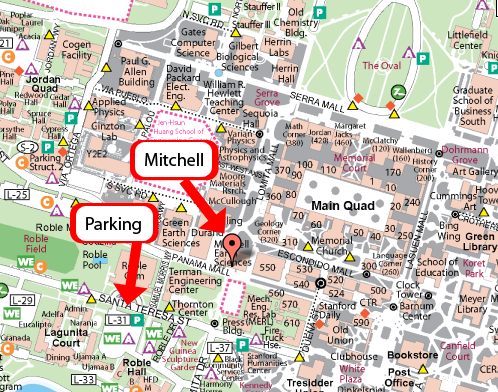 Walk down Morris Way, turn right when you reach the Green Earth Sciences Building and Mitchell will be the second building on your left. Take the Page Mill Road exit and head east. Turn left onto Junipero Serra Blvd. After ~1-2 miles, when you see the Stanford Golf Course, turn right onto Campus Drive West (don’t turn into Campus Drive East). Santa Theresa St. will be the first street on the right hand side. Turn right and park in the area between Morris Way and Lomita Drive. Walk down Morris Way, turn right when you reach the Green Earth Sciences Building and Mitchell will be the second building on your left. Take the Sand Hill Road exit and head east. Turn right on Stock Farm Rd, turn right onto Campus Drive West. Santa Theresa St. will be the first street on your left. Proceed on Santa Theresa until you come to a stop sign at the intersection with Morris Way. Turn right and park in the lot between Morris Way and Lomita Drive. Walk down Morris Way to Panama Way, turn right when you reach the Green Earth Sciences Building and Mitchell will be the second building on your left.